Did you know that French Toast may not be be French at all, but Roman? A recipe was found in a cookbook from the 1st century AD Roman cookbook called Apicius. 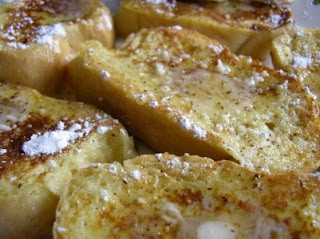 The people of Belgium and France call it pain perdu (“lost bread”) since it is a way to use stale, “lost” bread. Break fine white bread, crust removed, into rather large pieces which soak in milk [and beaten eggs], fry in oil, cover with honey and serve. Modern version: Beat eggs and milk together. Dip bread in batter. Fry in hot skillet, turning after each side browns. Serve hot with warmed honey. Sprinkle with cinnamon if desired. Per serving (without honey): 235 calories, 12 g protein, 26 g carbohydrates, 9 g fat, 3 g saturated fat, 221 mg cholesterol, 329 mg sodium.